Follow these 10 basics for beautifully painted kitchen cabinets. Clean dirt and grease off cabinets using TSP (trisodium phosphate) found at your local home or hardware store. Be sure to wear gloves when handling! Remove cabinet faces, drawers, and hardware using a screw driver. Number and group each so you know which pieces belong together — you will thank yourself for this foresight when reassembling. Sand cabinet base, drawers, and faces so that your paint will "take" — make sure to wipe down with a tack cloth after to remove residue. Repair any cracks or other damages in wood by using wood filler — be sure to sand down so there are no rough spots and clean residue thoroughly. Tape off ceiling, counter, and cabinets and lay plenty of drop cloths where needed. Apply one coat of good-quality primer on all wood surfaces. Apply two coats of gloss or semi-gloss interior latex paint or high-quality acrylic paint specifically made for kitchen and bath woodwork (to withstand moisture and wear) — allow several hours to dry between coats. Once your two coats are applied, scout for needed touch-ups and let paint dry for at least 24-48 hours. Apply two coats water-based polyurethane to act as a seal; again, allow at least 24 hours to dry before putting cabinets back together. 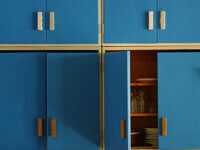 Reattach hardware and cabinets and reload all your displaced contents. Then, enjoy your new, colorful, and stylish kitchen!